Oxbridge has long faced criticism for accepting too many students from privileged backgrounds. But one Oxford college, Mansfield, stands apart from the rest, with nine in 10 of the students it admitted this year coming from state schools. How has it achieved this? In a recent report, David Lammy launched a scathing attack after data he obtained showed the number of students accepted at Oxford and Cambridge universities heavily skewed towards those from the Home Counties and from well-off families – with the numbers edging upwards. The MP criticised the universities’ colleges for being “fiefdoms of entrenched privilege”. Across Oxford the number of state school-educated students is about 60% – the independent sector accounts for 6.5% of all pupils nationally – but at Mansfield College that figure has jumped to above 90%. The college’s website prominently describes it as “open, friendly, welcoming”, and both staff and students are proud of its reputation for diversity. Opened in Oxford in 1886, the college’s original purpose was to provide further education for nonconformist ministers, and that anti-establishment streak has carried on down the generations. The college’s JCR Committee president and third-year history student Joe Inwood said some Oxford colleges were set up specifically to be exclusive and elitist, and that might be reflected in their make-up today. But Mansfield “has the opposite legacy, because it was created so people who were excluded by everyone else could come, and that has followed down the years”. One beneficiary is first-year maths student Codie Wood, who went to school in a working-class area of Salford and initially didn’t think Oxford would be for her. “Oxford always seemed something kind of unattainable,” she said. “It was something that posher people from private schools went for, and not something I would have considered. Staff put Mansfield’s success down to an access and outreach programme that involves about a third of its students. College representatives make thousands of visits every year to schools across the UK, dispelling myths and offering advice to students who might never have thought Oxford was a realistic goal. Senior tutor and and tutor for admissions Lucinda Rumsey said the college had regularly achieved the university’s largest proportion of state school students over the past 17 years. “How we got where we are is partly that we started a long time ago,” she said. “We decided nearly 20 years ago to run a project to encourage students from further education colleges to apply to Oxford. Within a couple of years the university as a whole was receiving more applicants from that sector – with many applying to Mansfield. Since 2001 the percentage of state school students admitted to Mansfield has risen from 67.1% to regularly in excess of 80%, hitting a high of 91.4% for its most recent intake. Mansfield’s success shows “that the talent is there if Oxbridge colleges make it a priority to go out to hard-to-reach areas and find it”, Mr Lammy told the BBC. He added that the college’s recent results, which are the best in its history, showed that widening access does not lower standards. He said: “My fear is that the Oxbridge collegiate system means that real change will not be forthcoming. What we are seeing is a concerted effort by some colleges being undermined by the majority. Oxford University said addressing inequality “requires a huge, joined-up effort across society”, and the House of Commons Education Select Committee is planning to look into the issue. Access and admissions officer Helen Brooks said Mansfield runs events with schools every year, some of which might never have sent a student to Oxbridge before. She said: “Part of our work does involve dispelling myths and misconceptions about Oxford in particular, but we also support schools in providing advice and guidance about higher education more generally. She added that the college used “a robust system of contextual data” which includes information both about the candidate’s school or college and also about the area in which they live. Aondoyima Ioratim-Uba, Mansfield’s Junior Common Room access officer, said the college’s success in attracting students from state schools had helped to breed further success. “We are kind of in this ideal situation, where we have lots of access already going on, so when people come here they get involved in that too,” he said. Ms Rumsey said she hoped the college would continue to widen access and increase its diversity, but warned that any future plans were dependent on money. “We are the poorest college by some way and we have the smallest resources,” she said, although she added that Mansfield would continue visiting schools to spread the message that Oxford is not just for the well off. 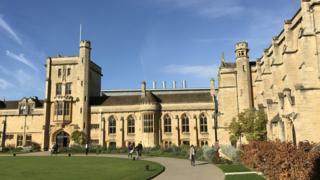 She said the college would like to find the funds to meet the travel costs of prospective students visiting Oxford, “as many can’t afford the train fare”. And so clearly there is still work to be done, even for a college that admits a higher percentage of state-educated students than any other. Mansfield College’s simple goal is spelled out by Helen Brooks.